In May 2013 I will participate in the 29th doctoral colloquium in Paris organized by the European Accounting Association. There I will present my current research program and learn from other participants how to become a better researcher. Also, after the colloquium all students are invited to listen to the EAA 2013 conference. The literature review by Franco-Santos, Lucianetti & Bourne (2012) is a great overview of 76 studies ranging from 1992 until 2011. The review is well structured into three blocks: consequences of performance management for people’s behaviour, consequences for organizational capabilities and consequences for performance. To link performance management (PM) to the three blocks the authors develop a topology based on the work of Speckbacher, Bischof, & Pfeiffer (2003) and differentiate between 4 types of PM. In the attachment of the paper a comprehensive table which includes theory used, data collection & analysis, summary of results and other information is included. Tessier & Otley (2012) develop a conceptual framework to describe management control based on the Simons’ “Levers of Control”. In this article they first discuss the ambiguities in the original framework and then propose an improved version of it. This is a very well written article that will probably help to improve the theory of management control. Finally, Taticchi, Balachandran & Tonelli (2012) use the citation analysis method to provide an overview of the knowledge dissemination in the research area. They also include several tables that show the most central performance management frameworks in literature. Speckbacher, G., Bischof, J., & Pfeiffer, T. (2003). A descriptive analysis on the implementation of Balanced Scorecards in German-speaking countries. Management Accounting Research, 14(4), 361–388. Taticchi, P., Balachandran, K., & Tonelli, F. (2012). Performance measurement and management systems: State of the art, guidelines for design and challenges. Measuring Business Excellence, 16(2), 4. Tessier, S., & Otley, D. (2012). A conceptual development of Simons’ Levers of Control framework. Management Accounting Research. Bititci, Carrie & McDevitt, 1997 define performance management as a “process by which the company manages its performance in line with its corporate and functional strategies and objectives”. This definition is often used in management research studies. According to Bititci, Carrie & McDevitt, it is the objective of that process to provide an integrated control system, where the corporate and functional strategies are deployed to all business processes, activities, tasks and personnel, and feedback is obtained through the performance measurement system to enable appropriate management decisions. The ultimate purpose of that process is to improve company performance. business perspective (e.g. Bourne, Neely, Mills & Platts, 2003; Henri, 2004). A more detailed discussion regarding the “good definition” of performance management is to be found in Franco-Santos et al., 2007. The authors review several definitions from literature and identify the key characteristics of performance management. To better understand why a “good definition” is so important, you may want to look into the guidelines on the concept definitions in management research by Bisbe, Batista-Foguet & Chenhall, 2007. They provide an easy to understand “how to” description. Finally, if you are interested in a recent overview the latest performance management literature, Franco-Santos, Lucianetti & Bourne, 2012 is a good choice. The authors propose a 4-dimensioanal framework how to structure performance management literature, which can be used for literature reviews. Bisbe, J., Batista-Foguet, J.-M., & Chenhall, R. H. (2007). Defining management accounting constructs: A methodological note on the risks of conceptual misspecification. Accounting, Organizations and Society, 32(7-8), 789–820. Bititci, U. S., Carrie, A. S., & McDevitt, L. (1997). 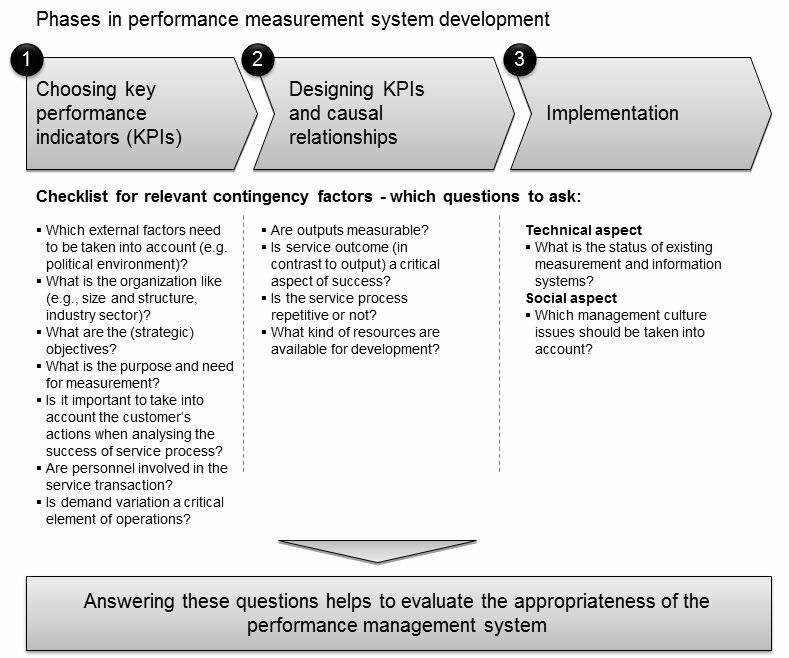 Integrated performance measurement systems: A development guide. International Journal of Operations & Production Management, 17(5), 522–534. PDF: Bourne, M., Neely, A., Mills, J., & Platts, K. (2003). Implementing performance measurement systems: A literature review. International Journal of Business Performance Management, 5(1), 1–24. PDF: Chenhall, R. H., & Langfield-Smith, K. (2007). Multiple perspectives of performance measures. European Management Journal, 25(4), 266–282. PDF: Franco-Santos, M., Kennerley, M., Micheli, P., Martinez, V., Mason, S., Marr, B., … (2007). Towards a definition of a business performance measurement system. International Journal of Operations & Production Management, 27(8), 784–801. Grafton, J., Lillis, A. M., & Widener, S. K. (2010). The role of performance measurement and evaluation in building organizational capabilities and performance. Accounting, Organizations and Society, 35(7), 689–706. PDF: Henri, J.-F. (2004). Performance measurement and organizational effectiveness: Bridging the gap. Managerial Finance, 30(6), 93–123. Lebas, M. J. (1995). Performance measurement and performance management: Proceedings of the 12th International Conference on Production Research. International Journal of Production Economics, 41(1-3), 23–35. PDF: Neely, A., Gregory, M., & Platts, K. (1995). Performance measurement system design: A literature review and research agenda. International Journal of Operations & Production Management, 50(4), 80–116. Neely, A., Gregory, M., & Platts, K. (2005). Performance measurement system design: A literature review and research agenda. International Journal of Operations & Production Management, 25(12), 1128–1263. Much research that investigates the contingency factors related to performance management has been published in the last decade. This research often focuses on such questions as the impact of strategy, environmental uncertainty, organizational structure or firm size, existing technology or culture on the effectiveness of performance management. In general, the results of these studies show that certain combinations of contingency factors are more favorable for the success of performance management then others. For example, it has been widely reported that companies pursuing a cost-leadership strategy are better off with formal and highly structured performance management systems. Recent and more complex studies go further and investigate combinations of several contingency factors or even identify new factors that were not previously visible on the academic radar. For instance, the study by Chenhall et al. (2011) went on to understand the relationships between strategy, social networking, culture, and formal controls. The academics build a conceptual model which revealed that the interplay of social networking, culture and strategy together with formal performance controls have an implication on the ability of the company to innovate. For academics, this study (or any other break through research) has a tremendous impact: it shows how our understanding of the world can be improved and the theory of performance management to further developed. But, how does it help the practitioner? One possible answer is provided by Jääskeläinen et al. (2012). The authors proposed a checklist which can be used by managers during the development of performance management systems. In that list, a generic design process of performance management system was enriched by a list of questions needed to be answered in each process stage. The questions asked by the designer team (typically a consultant team) can help to create an understanding of the relevant contingency factors. I guess, this is how the performance management designer can profit from the academic research. Chenhall, Robert H.; Kallunki, Juha-Pekka; Silvola, Hanna (2011): Exploring the relationships between strategy, innovation, and management control systems. In Journal of Management Accounting Research 23 (1), pp. 99–128. Jääskeläinen, Aki; Laihonen, Harri; Lönnqvist, Antti; Palvalin, Miikka; Sillanpää, Virpi; Pekkola, Sanna; Ukko, Juhani (2012): A contingency approach to performance measurement in service operations. In Measuring Business Excellence 16 (1), pp. 43–52. When does performance management increase performance? The role of contingencies. Performance management has been recognized as a success factor for high performing companies. Researchers produced a large body of knowledge trying to discover how performance management impacts performance. One insight from that research is that there is no single best way to performance management (Lee and Yang, 2011). On contrary, various approaches co-exist in different settings and in different companies. Consequently, the question now is to understand which approach is most beneficial given the specific circumstances – the contingencies – of the company. This PhD work provides an overview of the recent contingency research in performance management and is built around two questions: 1) what type of performance management is used by companies given their specific contingencies, and 2) what is the performance impact of PM under different contingencies. Building on Covaleski et al. (2003) and Gerdin and Greve (2004) a literature review framework is created and methodological issues are considered. The body of performance management research grew dramatically in the last decade. Bititci et al. (1997) define performance management as a “process by which the company manages its performance in line with its corporate and functional strategies and objectives”. According to them, it is the objective of that process to provide an integrated control system, where the corporate and functional strategies are deployed to all business processes, activities, tasks and personnel, and feedback is obtained through the performance measurement system to enable appropriate management decisions. The ultimate purpose of that process is to improve company performance. Many researchers study the performance consequences of PM. However, empirical results are often unclear and contradictory (Langfield-Smith, 1997). For example, one group of authors claim that PM is beneficial and leads to performance gains (Ittner et al., 2003; Said et al., 2003; van der Stede et al., 2006), another group of authors found no impact (Ittner and Larcker, 1995) and the last group found negative impact (Ittner and Larcker, 1997). Such unclear empirical evidence limits theory development and therefore additional research needs to be performed. It has been argued that additional research can benefit from the insights provided by the contingency theory which may help to resolve existing contradictions and lead to a creation of consistent body of knowledge (Ittner and Larcker, 2001; 2009). Chenhall, 2003 provides an overview of contingency-based studies in management accounting. The central message of the contingency theory is that success of any management control initiative (e.g. performance management) is dependent on the contingencies of the company (Govindarajan, 1988; Chenhall, 2003; 2006). Contingencies are factors that are potentially significant for the implications of performance management. These can be externally given (e.g. environmental uncertainty, competition) or internally created (e.g. strategy) (Ittner and Larcker, 2001). Contingency research in performance management area has its roots in the management accounting and control literature (Chapman, 1997; Chenhall, 2003; Fisher, 1998; Jones, 1985; Otley, 1980). Applied to performance management, the contingency paradigm states that there is no universally appropriate performance management approach equally suitable for all companies in all circumstances (Jermias and Gani, 2004). Consequently, factors such as strategy, environmental uncertainty and size have to be aligned with the performance management to unleash its’ performance effect (Jääskeläinen et al., 2012; Jermias and Gani, 2004). As a part of the set of rational agent models (Kilfoyle and Richardson, 2011), contingency theory is built on two assumptions: bounded rationality and equilibrium (Covaleski et al., 2003). The bounded rationality assumes that rational agents act to maximize their self-interest, but at the same time they are equipped with only limited cognitive resources (Covaleski et al., 2003). Thus, any initiative that aims at aligning individual behavior with the organizational interest must fail. For example, managers can make mistakes in designing organizational structure or develop sub-optimized processes, and employees’ responses to such mistakes will cause waste of resources and lower performance. On the other hand, the assumption of equilibrium implies that each organization can reach the state of “fit” which is “a combination of organizational and contingent characteristics [that] produces higher organizational performance than alternative combinations” (Covaleski et al., 2003). In the equilibrium state “an underlying congruence between context and structure [exists]” (Drazin and van de Ven, 1985). The consequence of the equilibrium assumption is that organizations either move towards the “fit” or they disappear from the market (Donaldson, 2001). With other words, properly “fitted” organizations have higher chances of survival. This paper extends the research in three ways. First, it builds on prior work (Cadez and Guilding, 2008; Chenhall, 2003; Chenhall and Langfield-Smith, 2007) and provides a systematic overview of the empirical results in contingency research of performance management. For instance, adding to Chenhall (2003) this paper provides an overview of propositions raised in literature and summarizes supporting and contrasting evidence. Second, following Covaleski et al. (2003) and Gerdin and Greve (2004) results are compared in terms of study design, concepts used, operationalization and validity issues. Finally, gaps in research are identified and avenues for future research are proposed. Bititci et al. (1997), “Integrated performance measurement systems: A development guide“, International Journal of Operations & Production Management, Vol. 17 No. 5, pp. 522–534. Cadez and Guilding (2008), “An exploratory investigation of an integrated contingency model of strategic management accounting“, Accounting, Organizations and Society, Vol. 33 No. 7/8, pp. 836–863. Chapman (1997), “Reflections on a contingent view of accounting“, Accounting, Organizations and Society, Vol. 22 No. 2, pp. 189–205. Chenhall (2003), “Management control systems design within its organizational context: Findings from contingency-based research and directions for the future“, Accounting, Organizations and Society, Vol. 28 No. 2-3, pp. 127–168. Chenhall (2006), “Theorizing contingencies in management control systems research“, In: Chapman, C.S. (Ed. ), Handbooks of Management Accounting Research, Elsevier, pp. 163–205. Covaleski et al. (2003), “Budgeting research: Three theoretical perspectives and criteria for selective integration“, Journal of Management Accounting Research, Vol. 15, pp. 3–49. Donaldson (2001), “The contingency theory of organizations“, Sage Publications, Thousand Oaks. Drazin and van de Ven (1985), “Alternative forms of fit in contingency theory“, Administrative Science Quarterly, Vol. 30 No. 4, pp. 514–539. Fisher (1998), “Contingency theory, management control systems and firm outcomes: Past results and future directions”, Behavioral Research in Accounting, Vol. 10, pp. 47. Gerdin and Greve (2004), “Forms of contingency fit in management accounting research: A critical review“, Accounting, Organizations and Society, Vol. 29 No. 3-4, pp. 303–326. Govindarajan (1988), “A contingency approach to strategy implementation at the business-unit level: Integrating administrative mechanisms with strategy“, Academy of Management Journal, Vol. 31 No. 4, pp. 828–853. Ittner and Larcker (1995), “Total quality management and the choice of information and reward systems“, Journal of Accounting Research, Vol. 33 No. 33, Supplement, pp. 1–34. Ittner and Larcker (1997), “Quality strategy, strategic control systems, and organizational performance“, Accounting, Organizations and Society, Vol. 22 No. 3-4, pp. 293–314. Ittner and Larcker (2001), “Assessing empirical research in managerial accounting: A value-based management perspective“, Journal of Accounting and Economics, Vol. 32 No. 1-3, pp. 349–410. Ittner and Larcker (2009), “Extending the boundaries: Nonfinancial performance measures“, In: Chapman, C.S., Hopwood, A.G., and Shields, M.D. (Eds. ), Handbook of management accounting research, Elsevier Science, Oxford, pp. 1235–1251. Ittner et al. (2003), “Performance implications of strategic performance measurement in financial services firms“, Accounting, Organizations and Society, Vol. 28 No. 7-8, pp. 715–741. Jääskeläinen et al. (2012), “A contingency approach to performance measurement in service operations“, Measuring Business Excellence, Vol. 16 No. 1, pp. 43–52. Jermias and Gani (2004), “Integrating business strategy, organizational configurations and management accounting systems with business unit effectiveness: A fitness landscape approach”, Management Accounting Research, Vol. 15 No. 2, pp. 179–200. Jones (1985), “An empirical study of the evidence for contingency theories of management accounting systems in conditions of rapid change“, Accounting, Organizations and Society, Vol. 10 No. 3, pp. 303–328. Kilfoyle and Richardson (2011), “Agency and structure in budgeting: Thesis, antithesis and synthesis: Norman Macintosh and Critical Accounting Research: A Festschrift”, Critical Perspectives on Accounting, Vol. 22 No. 2, pp. 183–199. Langfield-Smith (1997), “Management control systems and strategy: A critical review“, Accounting, Organizations and Society, Vol. 22 No. 2, pp. 207–232. Lee and Yang (2011), “Organization structure, competition and performance measurement systems and their joint effects on performance“, Management Accounting Research, Vol. 22 No. 2, pp. 84–104. Otley (1980), “The contingency theory of management accounting: Achievement and prognosis“, Accounting, Organizations and Society, Vol. 5 No. 4, pp. 413–428. Said et al. (2003), “An empirical investigation of the performance consequences of nonfinancial measures“, Journal of Management Accounting Research, Vol. 15 No. 1, pp. 193–223. van der Stede et al. (2006), “Strategy, choice of performance measures, and performance“, Behavioral Research in Accounting, Vol. 18, pp. 185–205. Managers and business management researchers around the globe are increasingly interested in understanding the secrets of high performing organizations. The search for the keywords “high performance organizations” delivers a list of over 2700 books at Amazon.com. Organizations such as the Performance Management Association (PMA) report a rapidly growing number of members. The attendance to the conferences and seminars around the topics of high performing organizations shows constant growth in Europe and in US. Finally, almost all leading consulting companies established teams that provide professional advisory services to private and public organizations, which by now have become a multimillion dollar business (e.g. Tollman et al. 2009). Since the 1980s, advances in business management research led to the development of various theoretical frameworks describing the characteristics of high performing organizations. Top selling books by Tom Peters and Bob Waterman “In Search of Excellence” and “Built to Last” by Jim Collins are just two of the most prominent examples. While in depth overview of these framework has been intensively described elsewhere (e.g. Bourne et al. 2009; de Waal 2010), the essence of these books can be summarized as follows: few success factors such as “strategy alignment”, “customer orientation” and “personnel excellence” are often shared by high performing organizations. Such statements may be familiar to you and they may provide you with rhetorical ammunition for the next top executive meeting. But does it really help to manage the business? Despite the great success of the books like “In Search of Excellence” and “Built to Last”, this work has been criticized for being far too general and imprecise for companies to be able to work with. In fact, these success factors are very abstract and are applicable to almost all existing organizations. With other words, this general knowledge is of little value for the practice (Duncan and Harrop 2006). In 2010s managers want to know exactly which characteristics make their specific organization successful. They want to understand them, to set up projects and to deliver tangible results. The question for managers today remains – which high performance characteristics does my company have and how can these characteristics be managed? Make decisions: do your decisions have an impact on the success factors and consequently on the performance? Klick on the chart below to see the framework. In the following blogs, I will report on each of the four steps presented above starting with the first step. You will find out how powerful statistical methods enable managers to better understand the performance driving characteristics of their organizations and which are worth being actively managed. Bourne, Mike; Mura, Matteo; Franco-Santos, Monica; Pavlov, Andrey; Martinez, Veronica; Lucianetti, Lorenzo (2009): Performance management practices and the drivers of business performance. Performance Measurement Association Conference Paper. Centre for Business Performance. Bedfordshire. Duncan, Sue; Harrop, Anne (2006): A user perspective on research quality. In International Journal of Social Research Methodology 9 (2), pp. 159–174. Available online at 10.1080/13645570600595462. 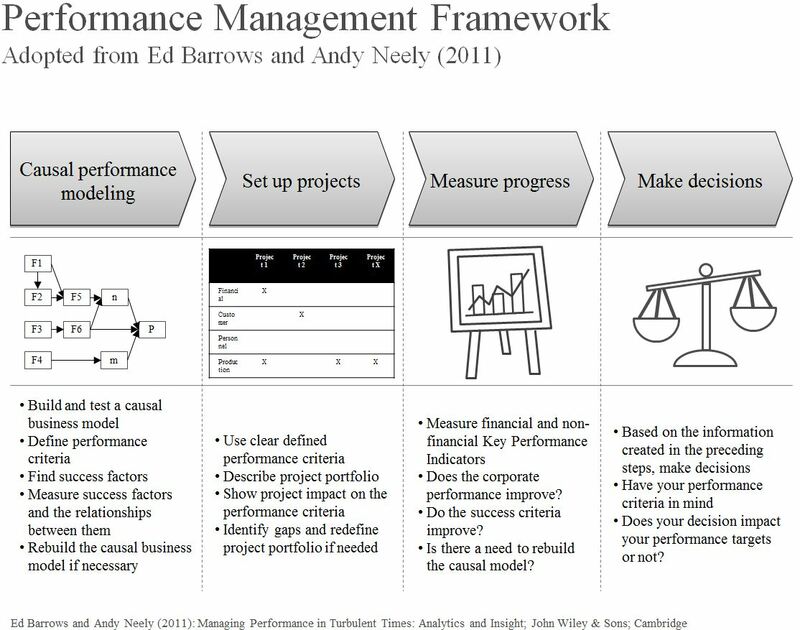 Ed Barrows and Andy Neely (2011): Managing Performance in Turbulent Times: Analytics and Insight ; John Wiley & Sons; Cambridge. Pavlov, Andrey; Bourne, Mike (2011): Explaining the effects of performance measurement on performance. An organizational routines perspective. In International Journal of Operations & Production Management 31 (1), pp. 101–122. Tollman, Peter; Bixner, Ralf; Keenan, Perry; Powell, Kimberly (2009): Cascading change. Edited by Boston Consulting Group. Boston. Waal, André de (2010): Performance-driven behavior as the key to improved organizational performance. In Measuring Business Excellence 14 (1), pp. 79–95. Available online at http://www.emeraldinsight.com/journals.htm?issn=1368-3047&volume=14&issue=1. Huelsbeck, David P.; Merchant, Kenneth A.; Sandino, Tatiana (2011): On testing business models. In Accounting Review 86 (5), pp. 1631–1654. ► It demonstrates a clear roadmap to help management prioritize performance indicators based on influential directions and strengths of causal relationships. ► Three most essential evaluation indicators for banking performance are customer satisfaction, sales performance, and customer retention rate. ► Through the strategy map, management could better invest limited resources in the areas that need improvement most. ► Nonfinancial measures, particularly, in the customer perspective, may be more emphasized by the service sector as the foremost outcome measures. ► The proposed framework can be applicable to institutions in other industries. The Performance Management Association (PMA) and the Ambassador Group (Lukas Michel, SPHERE Advisors) are organizing a meeting for Performance Management and Controlling experts in Düsseldorf, Germany. This event offers a series of workshops and discussions by academics and practitioners relating to the current topics of performance management. You will meet me there. This page is dedicated to business performance management research. This is interesting for you if you are a student, a lecturer in the field or if you are just looking for latest developments in the literature.